By summer’s end, 300 UN observers will be recording their findings. The finding everyone knows already is that regime forces use violence. They fire at protesters and pound their neighborhoods. Some observers will say there are armed gangs, failing to acknowledge that people are defending themselves inside their neighborhoods. UN Security Council deliberations won’t resume until post-August. This means spring and summer will pass before the Security Council meets to consider the observers’ report. The same arguments will be used when trying to reach a consensus as to whether the Syrian regime is using the violence or not. The residential areas of Homs are pounded even though no fighters are there – not since Baba Amr, Khaldiya and Bayyada were blitzed. The aim is to drive away Homs’ population. Tragedy is regime forces don’t suffice with destroying neighborhoods. They chase fleeing civilians. This doesn’t happen only in the Homs district or along the borders with Turkey. It happens everywhere… Syrians are killed or arrested when staying put and pursued when fleeing to seek refuge. 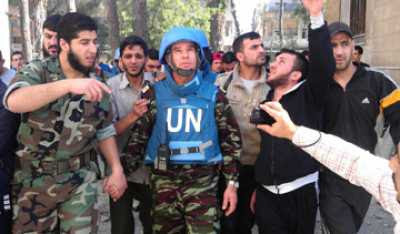 The UN gives the regime three months’ grace without saying what comes next. All we know is that Security Council meetings will be held in September to consider the UN monitors’ report. Then What? In a best-case scenario, a vote would take place on a draft resolution penalizing the Syrian regime. The vote will almost certainly produce a Russian veto. The monitors’ mission will come to nothing. With death and destruction persisting, the Security Council will likely hold follow-up sessions in December, when year-end holidays begin. Pragmatically, the situation cannot wait for the peaceful settlement being promoted by the Arab League secretary-general. He is mistaken. The day will come when people won’t forgive what he did and said. We discern a deliberate measure by a number of Arab and foreign countries to save the Syrian regime. The same nations that gave the regime cash, arms, men, time and media support have so far failed to stifle the Syrian revolution. The Syrian public won’t coexist with this regime. The regime won’t give up power. So how can you expect a political settlement, as Secretary-General Nabil Elaraby professes? The only conventional but untested solution is to enable Syrians to defend themselves. It’s the only way to rein in the Syrian regime’s brutal military and security machine. It is also the only way to persuade Russia and the rest to give up on their man in Damascus.